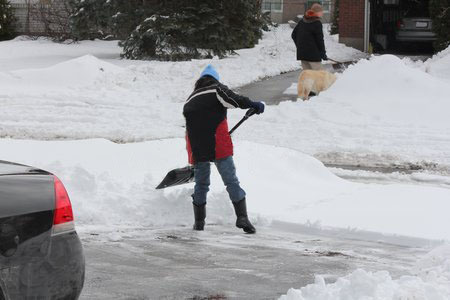 If you live up here in the Northeast, chances are that after a snowstorm, you use salt to de-ice your driveway, walkway, or patio. While salt does a great job melting the snow and ice, it can be bad for your lawn, garden, concrete, pavers, pets, and car. As an asphalt driveway resurfacing company, we’ve had to complete multiple resurfacing jobs on asphalt and concrete that was dried out and damaged because of the effects of salt. In addition to drying out hardscapes, salt can also dry out the paws on your pet, can corrode the metal on the underside of your car, and can damage your plants if it gets into the soil. Not only that, but the salt used on roadways and sidewalks gets washed into lakes, streams, and/or groundwater supplies. Sand not only absorbs sunlight, which can help snow and ice melt, but it also adds traction so that your friends and family don’t slip and fall. Though it doesn’t melt the snow and ice, kitty litter is like sand in the fact that it also adds traction for a non-slip surface. Both kitty litter and sand need to be applied on top of the snow to be effective. Because vinegar contains citric acid, it will help melt snow and ice. It may take a few applications, however. Sugar beet juice is one of the most environmentally friendly ways to de-ice your home. The juice from sugar beets lowers the melting point of ice and snow. It’s also completely safe for roads, pets, plants, grass, cars, and concrete. Another environmentally friendly way to melt snow and ice. alfalfa meal is usually used as a fertilizer, so it’s 100% natural. It’s also grainy, so you’ll get some traction. Like sand, coffee grinds will absorb sunlight to help melt snow and ice faster. It will also give you a non-slip surface. Calcium chloride is a less-harsh alternative to salt, and actually works better when temperatures are low (between 0 degrees and 30 degrees Fahrenheit).